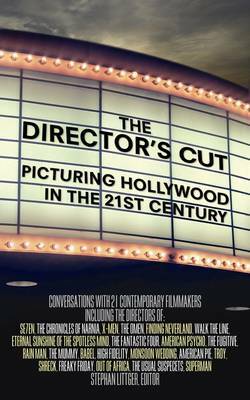 In "The Director's Cut", 21 Hollywood filmmakers share the thrilling accounts of their creative journeys into the film industry's most coveted positions. Together, their films have won dozens of Oscars. Each conversation provides a revealing and in-depth exploration of each director's artistic roots - giving readers an unparalleled understanding of the very different environments and attitudes that these outstanding filmmakers have experienced and embraced in their careers and personal lives. The directors in this book have been chosen on grounds of their reputation, sustained popularity at the box office, and diversity of background - both professional (genre, style, etc) and personal (family, origin, etc). The book truly reflects the variety of talent that has arrived from all over the world to make movies in Hollywood today. Thanks to the candid honesty and openness of these directors, this collection offers illuminating insights into their creative decision-making processes and the key biographical moments in their lives. Stephan Littger's own background as a young filmmaker and an Oxford graduated psychologist enables him to approach these star directors in an empathetic and focused manner, helping them to talk openly about the years of emotional struggle, personal doubt and tentative success that are part of every filmmaker's life. "The Director's Cut" should become a standard volume for aspiring filmmakers. And it's also a compelling and entertaining read for committed moviegoers and anyone interested in the marriage between artistic creation and commercial success. It includes conversations with: Andrew Adamson - "Shrek"; Andrew Davis - "The Fugitive"; Richard Donner - "Lethal Weapon"; David Fincher - "Se7en"; Marc Foster - "Monster's Ball"; Stephen Frears - "High Fidelity"; Michel Gondry - "Eternal Sunshine of the Spotless Mind"; Mary Harron - "American Psycho"; Alejandro Gonzalez Inarritu - "21 Grams" Barry Levinson - "Good Morning Vietnam"; James Mangold - "Walk the Line"; Mira Nair - "Vanity Fair"; Wolfgang Peterson - "The Perfect Storm"; Sydney Pollack - "Tootsie"; Brett Rutner - "Rush Hour"; Peter Segal - "50 First Dates"; Bryan Singer - "X-Men"; Stephen Sonners - "The Mummy"; Tim Story - "Barbershop"; Mark S. Waters - "Mean Girls"; and, Chris Weitz - "In Good Company".